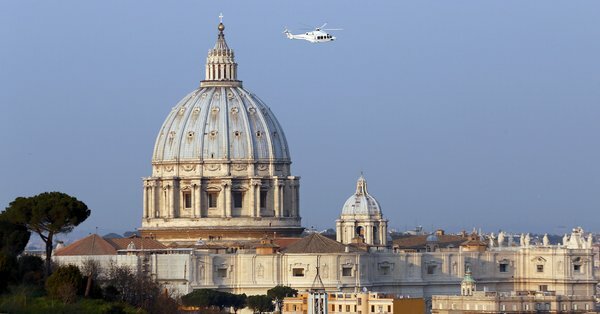 Pope Benedict XVI, the first pontiff in nearly 600 years to depart the seat of Bishop of Rome voluntarily instead of dying in office, flies off by helicopter: leaving the Vatican and the post he has held since 2005. Now begins sede vacante. The "time of the empty chair". One which in the days and weeks ahead, the cardinals of the Roman Catholic Church will seek to fill in prayerful guidance. Thus will this most persistent of institutions continue with a lineage of leadership stretching back to the ancient of days. But in the meantime, though I am not Catholic, this blogger wishes good luck and godspeed to Benedict XVI. May his days be long and fruitful! The new helicopter is much roomier than the one that Pope Gregory XII used in 1415 ;-).